With growing family needs and increasing congestion on the roads, people are on the lookout for a comfortable and premium seven-seater with an automatic transmission. Until 2015, you would have no choice but to pay a hefty sum of around Rs 30 lakh for something like that. 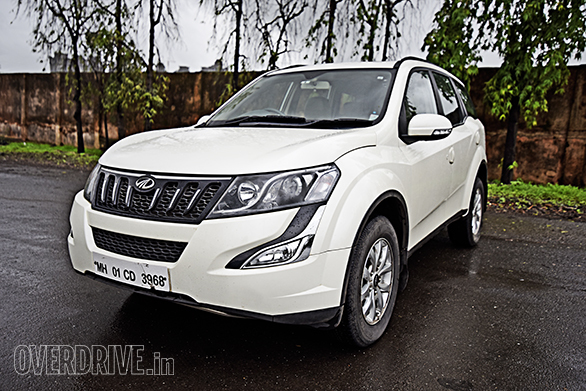 However, it was Mahindra that brought about a change in this profile with the XUV500 automatic. The XUV500 had already set a benchmark in the market, and the availability of an automatic gearbox in the segment made it more appealing. This year Toyota has managed to set a new benchmark with the Innova Crysta, literally in every aspect. 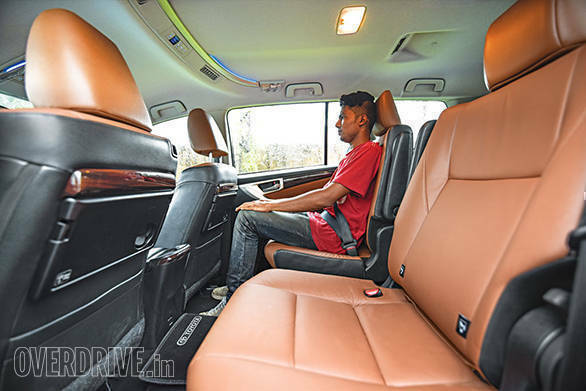 In addition to working on the shortcomings of the previous Innova, not that there were many, Toyota has managed to bridge the gap between regular and premium seven-seater vehicles in India. 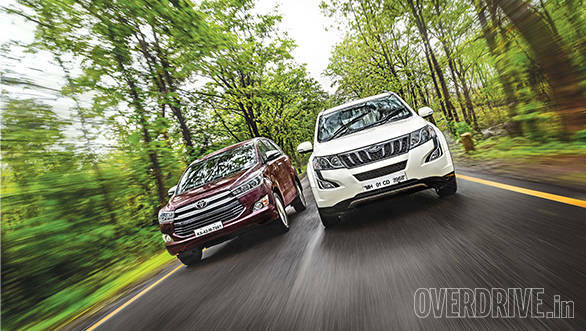 We were curious to find out if pitted against each other, will the Toyota Innova Crysta 2.8AT be a more versatile offering over the Mahindra XUV500 2.2 AT? The Innova Crysta has adopted Toyota's new design language which is also seen on its sedans. The front features an aggressive SUV-like design and comes with LED projector headlights. Although the side profile bears some resemblance to the previous Innova, the Crysta is a bit longer with the slightly stretched nose. The rear looks quite impressive with the protruding horizontal tail lights and a roof-integrated spoiler, which comes as standard across all variants. The XUV500 also gets an aggressive design and has dollops of muscle layered everywhere. Last year Mahindra updated the XUV500 with new headlights with S-shaped LED guide lights and a generous use of chrome wherever possible. Agreeably, these changes weren't substantial, but five years since its launch, the XUV500 still manages to look way more impressive than its rivals. Personally, the XUV500 commands more presence, whereas the new design has made the Innova Crysta look bolder than before. 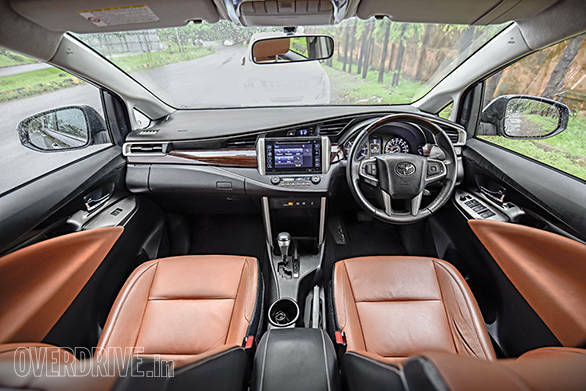 Step inside the Innova Crysta and you understand exactly why Toyota has taken five years to develop this car. Gone is the bland dashboard as the new wavy pattern takes over with a more driver-centric design. The dashboard gets a smart combination of faux wood, brushed aluminium and ebony shades. Paired with the rich walnut leather seats, the interior exudes premium appeal. The XUV500 lags behind in this department. The cabin, which came with some of the best features when launched, now seems a bit dated. That said, it's certainly not an eyesore with the dual-tone beige ebony finish and matte-finished trims running down the central console. The new instrumental cluster in the Crysta has a 4.2-inch multi-information screen. This displays an array of information such as fuel consumption, trip information, elapsed time, navigation, compass and a lot more. The centre console in the Crysta features just six buttons to access the automatic climate control. Toyota offers a 7-inch touchscreen infotainment system with navigation and a reverse camera in the ZX variant. Comparatively, the XUV500 gets a more modern infotainment system with a simple yet informative display. I did find the system has fewer features though. Where the Mahindra falls a bit behind is the plasticy feel and the numerous buttons which take time to get used to. Build quality isn't impressive, which can be seen in the inconsistent panel gaps, especially for a vehicle that costs upwards of Rs 20 lakh! The previous-gen Innova was known for its space and comfort. In the new iteration, Toyota has further increased comfort by offering larger seats with increased cushioning and more space. But if you plan on spending more time in the driver's seat, the XUV500's commanding driver's stance is definitely our pick. And that's because, even though the seats in the Crysta have a premium feel, the van-like driver's position is not appealing. The Crysta's second-row occupant has easy access to manually adjust the co-driver's seating position, which you can't in the XUV500. The seats are firmer making it better suited for long-distance driving. The Crysta retains its spacious prowess in the third row as well. It can seat two adults more comfortably and has the benefit of adjustable second-row seats. In the XUV500, however, the third row is cramped for adults and can accommodate two kids at best. In terms of practicality, the Innova Crysta has numerous storage pockets under the central console, cooler box on the dashboard and a large glove box underneath. Let's not forget those 22 bottle holders either. The XUV500 is also generous with storage space. It gets a two-part glove box, central storage above the dashboard and a cooler box placed between the front seats. The Innova Crysta offers a boot space of 300 litres with the third row in use and appears larger than that of the XUV500 (Mahindra brochure doesn't list the boot space). 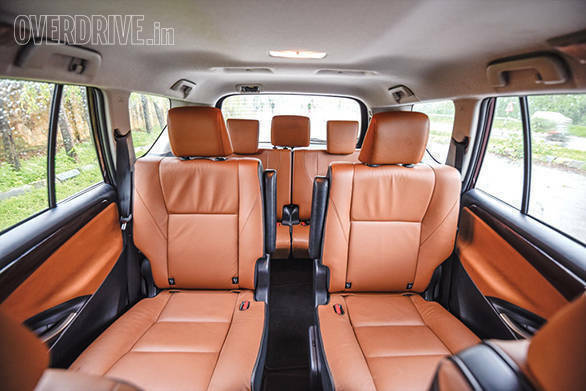 However, folding the third-row seats liberate the flat loading space in the XUV500, whereas that's not the case in the Innova Crysta. The top-spec Innova Crysta comes with seven airbags while the XUV500 gets six, one less because of the missing knee airbag (a feature that's standard even in the base Innova). Other safety features like ABS with EBD and vehicle stability programme are standard on both the vehicles. However, the XUV500 gets disc brakes on all wheels, but the Crysta gets discs only up front. The more powerful between the two is the Innova Crysta's 2.8-litre unit. It churns 174PS and makes 360Nm from an incredibly low 1,200rpm. On the other hand, the XUV500 uses a 2.2-litre engine that puts out 140PS and generates 330Nm between 1,600rpm and 2,600rpm. 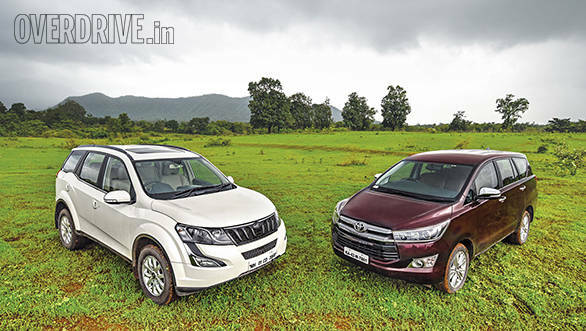 The Innova Crysta's 2.8-litre unit feels more refined and responsive compared to the XUV500's 2.2-litre unit. There is almost no turbo lag. Although power delivery isn't as linear, it isn't unnerving in the city either. On the highway, you realise the car's true potential - the 174PS motor allows comfortable cruising at speeds above 140kmph, something the previous-generation model couldn't boast of. The Crysta also comes with three driving modes - Normal, Eco and Power. Eco mode is perfect for city driving conditions where power isn't reduced considerably. The Normal mode is ideal for highway use, but if you prefer even stronger performance, Power mode will put a smile on your face. In fact, the Innova in Power mode crossed 100kmph in just 10.7 seconds! This makes it the quickest people mover under Rs 30 lakh. The XUV500 does the same in a slower but impressive 12.4 seconds. Even though the Toyota motor is fairly audible at lower engine speeds, impressive cabin insulation doesn't allow that noise to creep in at higher revs. 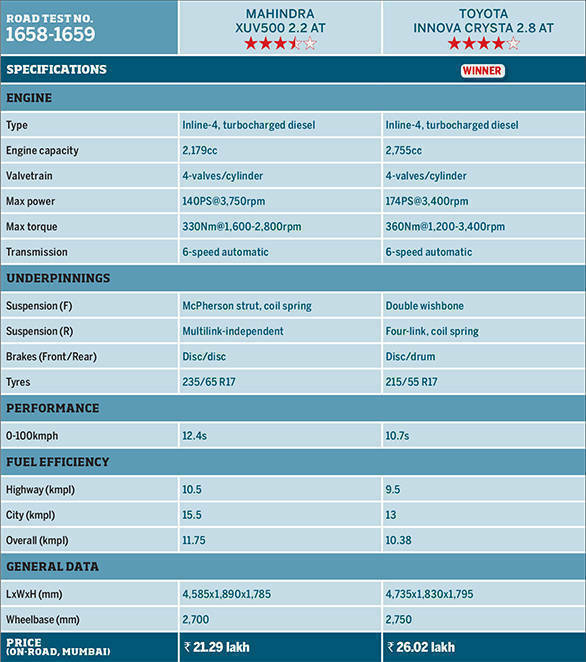 In comparison, the XUV500's 2.2-litre feels underpowered at low engine speeds. However, once the engine crosses the 2,000rpm mark, power delivery improves and the motor is in its element. The XUV500 works quite well as an everyday commuter. On the highway, the car gets to around 150kmph quite easily. However, NVH levels aren't as impressive, and a lot of wind noise seeps in past 120kmph. 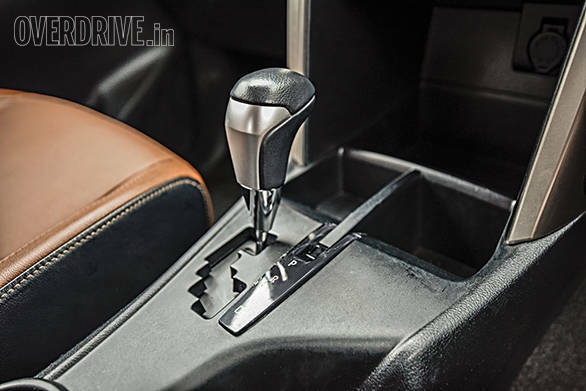 Both the Innova Crysta and the XUV500 are offered with 6-speed automatic transmissions. These are modern units and are both torque convertors. However, it's the Innova Crysta's unit that has the edge here. The gear shifts are smoother and more seamless. I personally liked its response to throttle inputs; this makes it the preferred vehicle of the two for driving, especially through bumper-to-bumper traffic. While on highways, pulling off quick overtakes is a breeze, and one isn't left wondering if the transmission will drop a gear in time. The autobox downshifts quickly to the appropriate gear bringing the engine in the meat of its power band. One doesn't have to shift manually. In fact, the rev happy nature of the 2.8-litre motor paired with the well-tuned ratios let the Crysta sprint to speeds up to 180kmph with relative ease. 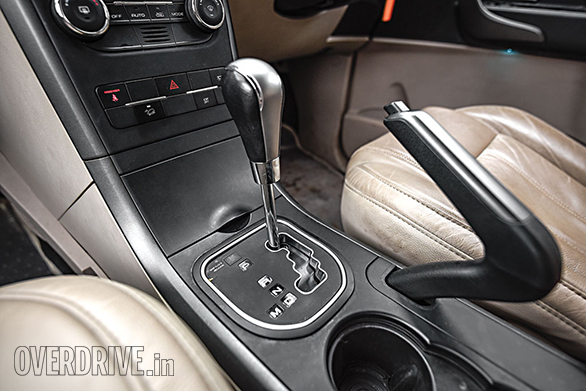 One can shift gears manually using the gear lever. I prefer this over the XUV's tiny shift button. The XUV500's Aisin-sourced 6-speed automatic offers smooth shifts, but they aren't as quick as in the Toyota. The transmission doesn't feel like it is in sync with the 2.2-litre mHawk engine. This is especially apparent while driving at highway speeds. Step on the throttle and the transmission gives you a downshift, but then there isn't much go as there is noticeable turbo lag. There is no significant improvement even when one shifts down gears manually. In manual mode, the system does not allow you to hold a gear close to the red line and will upshift eventually. The driving experience, however, is much better when one drives the XUV500 with a light foot in the city. Fuel efficiency is an important aspect when it comes to this test. The XUV500 returns 10.5 kmpl in town and increases to 15.5kmpl on the highway, translating to an overall figure of 11.75kmpl. One may expect the Innova to be less fuel-efficient because of its larger and more powerful oil burner. This, however, isn't the case. The Toyota comes close in town (9.5kmpl). Where it loses out more is on the highway (13kmpl) However, at 10.38kmpl, overall efficiency isn't a lot less than the XUV500. The Innova continues to use a body-on-frame chassis which Toyota claims is more rigid. 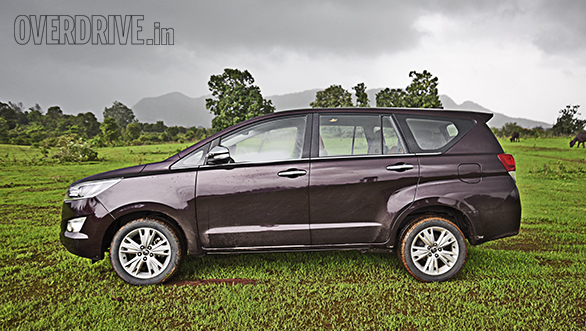 This and added safety as well as electronics make it 200kg heavier than the previous-generation Innova. Toyota has also added stronger springs to the suspension. The set-up is tuned more towards the softer side which does a fantastic job of absorbing uneven undulations. It keeps the cabin almost inert from disturbances while driving over potholes and speed breakers. But the Innova Crysta doesn't feel very nimble, and manoeuvring it around the city is not as convenient as the XUV500. However, the Innova Crysta is a lot more confident on straight sections, which makes it the ideal choice for the highway. The steering, which is although a bit heavy in the city, weighs up well as speeds increase. 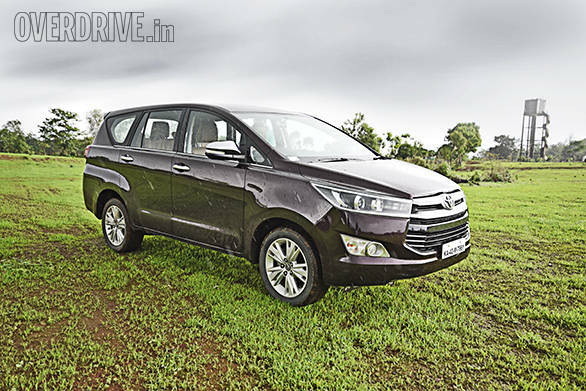 Additionally, the Innova Crysta feels more planted and stable on the highways. The XUV500 offers better performance in the city as well on the highway. With a more precise steering and agile nature, thanks to its monocoque chassis, the XUV500 is more fun to drive. However, the XUV500 gets a stiffer suspension set-up and doesn't feel as comfortable as the Innova Crysta, especially while dealing with potholes. That said, it trumps the MPV when it comes to cornering at higher speeds. One of the reasons for this is the fully independent rear suspension. While body roll has reduced considerably in the Innova Crysta compared to its predecessor, it isn't as controlled as the XUV500. While testing on wet roads, the XUV firmly held on to the tarmac even at high speeds. In terms of ride quality on the highway, the XUV500 doesn't absorb undulations as well as the Crysta. It should also be noted that the XUV500's gross weight is 60kg more than the Innova. The marginal weight difference, however, doesn't affect the XUV500's dynamics, making it the better handler. Mahindra's JK Tyres offer apt grip but create more road noise, whereas the Bridgestones on the Toyota do a better job. Also, better insulation in the Crysta gives it a further advantage in this case. Mahindra created a new segment with the XUV500. The design features and performance created a benchmark. Mahindra topped it up with attractive pricing, making it the only option for someone looking for an upmarket SUV at a reasonable budget. The 6-speed transmission does an impressive job of shifting through the gears, but the lazy response from the motor takes away this advantage. In addition, it misses on features like drive modes and a few comfort features. The XUV500 is positioned as Mahindra's premium offering, but at Rs 21.29 lakh (on-road, Mumbai), it does not justify the price. The new-generation Innova Crysta has been received rather well in the Indian market. Despite the ban on diesel vehicles displacing over 2,000cc in Delhi-NCR, Toyota has reported higher sales. Agreed, the top-spec ZX variant at Rs 26.02 lakh (on-road, Mumbai) feels steep. 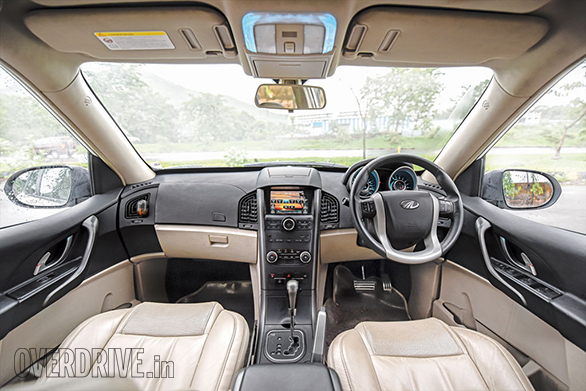 However, the new-age design with a plusher, feature-rich and spacious cabin makes it a far more premium option than the XUV500 or even its predecessor. The new 174PS 2.8-litre automatic simply adds to that appeal. Toyota has been known for its reliable offerings, and the Innova Crysta, even though an all-new product, will benefit from it with a higher resale value. However, if space and performance are your main concerns, Toyota offers a base variant GX with the 2.8-litre automatic priced at Rs 20.03 lakh (on-road, Mumbai). This makes it more affordable by Rs 1.26 lakh than the XUV500. It misses out on several features such as the chrome inserts, touchscreen infotainment system, navigation, rear zone automatic climate control, leather seats and ambient lighting in the ZX trim, but it's certainly not a deal-breaker. If Toyota can bring in a VX variant positioned between the GX and the ZX, packing more features than the base variant and also reducing the gap with the XUV500, the Innova Crysta will be an even more tempting buy. Yet the Innova Crysta even with its current range continues to offer better value and thus is the winner.